Well, actually, they're called the Diamond Girls because that's their name. They're not fabulously rich, or famous, or beautiful. They're a bit rough, but their hearts are in the right place - they're rough diamonds! There are four Diamond girls. There's Martine, Jude, Rochelle and Dixie. Four girls, four different fathers. But only Mum lives at home with the girls. So that makes five Diamond girls, really. But that's the end of the Diamond girl run because Mum's having another baby, and this time it's a boy. Mum knows because she's seen it in the stars. 'I'm doing this for all of us. We need a bigger place, now you're all having a little brother.' Mum patted her stomach. She said it as if we'd all begged for a brother. We'd all been appalled and embarrassed when she told us she was going to have another baby. 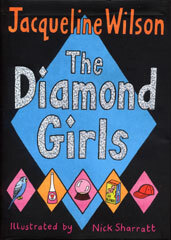 Can you imagine what it's like living in a house full of girls, even if they are Diamonds? Maybe you already know what it's like? With the Diamonds there's a great deal of squabbling, and tears and tantrums, and oodles of nail varnish and pink fluffy bits and pieces and bottle blonde hair. And there are boyfriends, of course. They cause a bit of a stir. It's all a bit much for Dixie, who's a dreamer. She hangs on to Bluebell. A budgie. Up her sleeve. Pretend. It was a small skinny guy with a bad haircut and round glasses. They didn't sit comfortably so he had to wrinkle his nose and hitch them up every few seconds. Poor Bruce. He doesn't know what's about to hit him! Read on. It's another lovely Jacqueline Wilson story, full of high drama and gentle moments, and the blinding truth. Highly recommended. I know you'll love it. If you enjoy Jacqueline Wilson so much you've read them all why don't you have a look at something by Anne Fine?